The area surrounding the Oregon Museum of Science and Industry offers an incredible opportunity to develop an “innovation district.” In addition to OMSI, this district includes the Portland Community College CLIMB Center, Oregon Rail Heritage Museum, Portland Opera, and Water Avenue Streetcar Station. The City of Portland has considered this area as part of a larger “Innovation Quadrant,” and construction of the Tillikum Crossing and TriMet Water Station assists in linking this district to the other three. 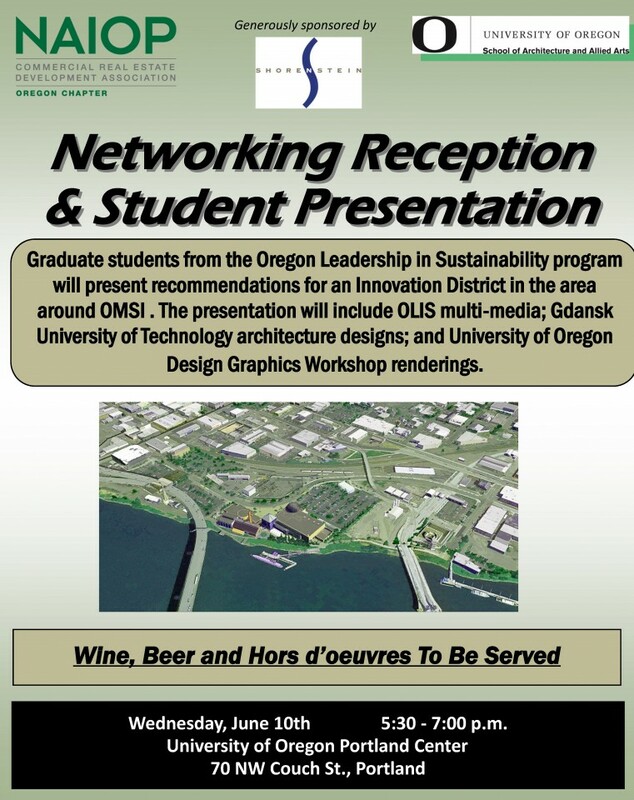 The Oregon Leadership in Sustainability (OLIS) program at the University of Oregon is currently researching development opportunities and will present these at this event. This is an international collaboration with architecture students from the Gdansk University of Technology in Poland, Chinese visiting scholars, and University of Oregon Sketchup students. Please attend this event to hear and see multiple visions for the future of this extraordinary Innovation District. For more information about this project, please contact Instructor Ric Stephens at ric@uoregon.edu.